13.8 billion years ago the big bang and quarks began. Soon quarks joined together in threes to make protons and neutrons. 380 000 years later the electrons joined to make atoms. Now the Universe was lots of gas. Gravity pulled it together to make stars. Big stars exploded to make rocks, gas, ice and dust. Gravity pulled some of this stuff together to make planets, moons, dwarf planets, asteroids, comets and more stars. 4.5 billion years ago the Earth was formed. In the beginning it was a ball of lava and gas. It was hit by another planet called Theia. The explosion formed the Earth and a ring of dust that later formed the moon. The Earth was hit by millions of meteors. Some of them brought lots of water. When the Earth cooled down it started to rain and the ocean formed. The first living things were like a bacteria that lived on the bottom of the ocean. They loved hot boiling water. These living things were called Archeae. Bacteria evolved from them. Some bacteria learned to use sunlight to make food. 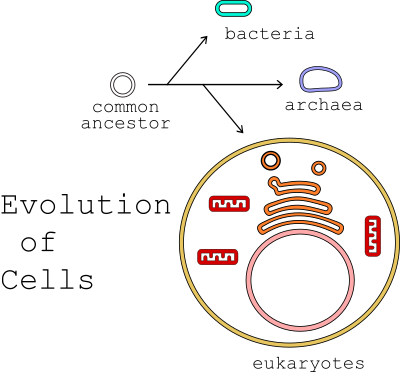 More complicated cells also evolved from Archeae. These complex cells, called eukaryotes, had lots of parts. Some cells united by gluing themselves together. That helped them survive better as a team. Later some cells had special jobs. Some cells became muscles to make animals move, other cells became eyes. The first complex animals probably looked like sacks. Nobody knows what the first animals really looked like because fossils are rare before the Cambrian explosion. 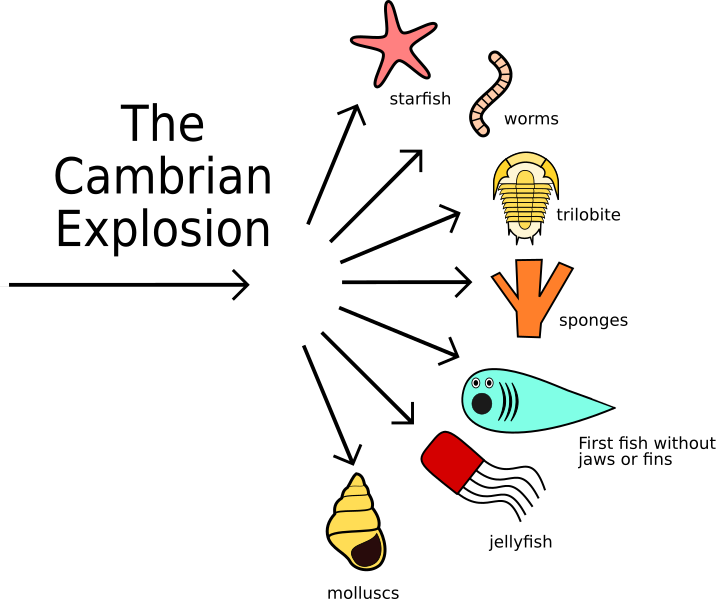 The Cambrian explosion began 541 million years ago and lasted 55 million years. It probably happened because there was much more oxygen to help animals move faster. Many animals became preditors. Others had to defend themselves. Some evolved hard shells. Some developed spikes on their skin. Others evolved ways to swim away fast. The first fish had a spine but no fins and no jaw. The next period is the Ordovician. In this period carbon dioxide in the air was much higher and sea levels rose. Simple plants like mosses started to invade the land. 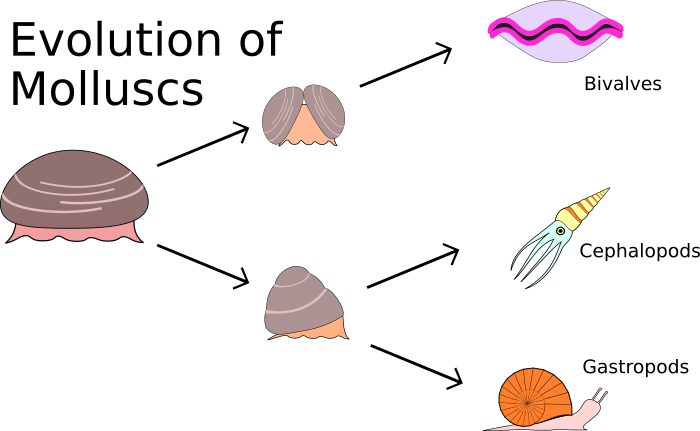 Some molluscs evolved two shells like clams. Other molluscs developed feet like the octapus. There was a mass extinction at the end of this period. In the Silurian period many types of fish with jaws and bones evolved. Jaws helped fish to catch bigger animals. For some animals it was very dangerous. They had to evolve even more to escape jawed fish. Some fish developed fins like fans to swim faster. Other fish developed bones and muscles in their fins, maybe to get around in crowded shallow waters away from giant fast fish. The Devonian was a very special period for fish. 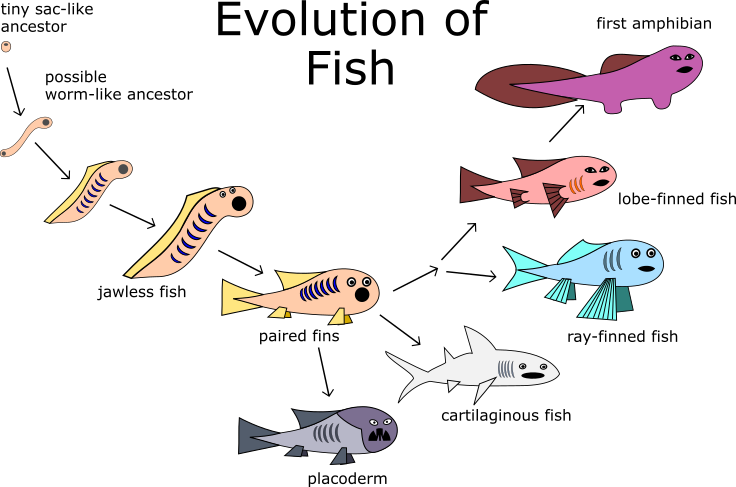 Many more types of fish evolved and they were the boss of the ocean. To escape from preditors some fish developed better kidneys so they can live in fresh waters like rivers, lakes and wetlands. Many more plants evolved including the first trees. The first amphibian evolved to escape from predators in the water and also to get more food from the land. 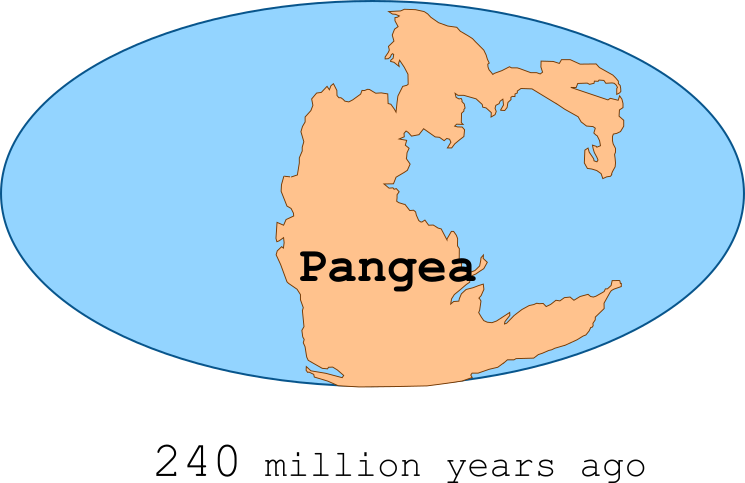 During the Carboniferous period Pangea was coming together. There were lots of land plants that made lots of oxygen that made insects huge. The first reptiles evolved. As some plants died they eventually turned into coal. The Permian period was more dry so there were not as many trees and not as much oxygen. At the end of this period there was the biggest mass extinction ever and all the trilobites died. This is end of the Paleozoic era. The Mesozoic era started 251 million years ago. The first period in this era was the Triassic. Lystrosaurus was the most common land animal with a back bone in the early Triassic. In the middle Triassic little dinosaurs existed. In the late Triassic more dinosaurs evolved. Some reptiles were evolving into mammals. There was a mass extinction at the end. 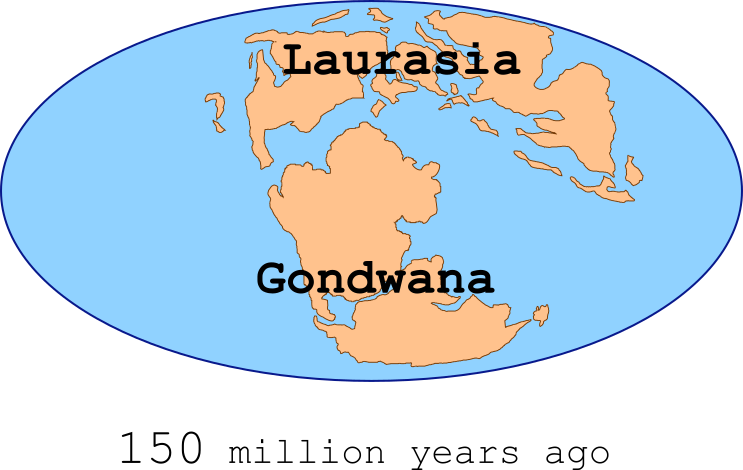 In the Jurassic period Pangea started to break apart into Laurasia in the north and Gondwana in the south. Many big dinosaurs evolved including Brontosaurus and Stegosaurus. The first bird evolved in the late Jurassic. 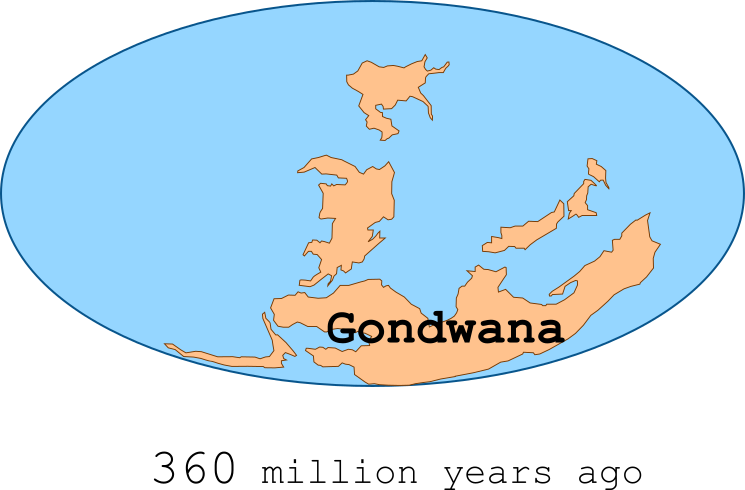 During the Cretaceous period Gondwana broke up into South America, Africa, India, Australia and Antarctica. 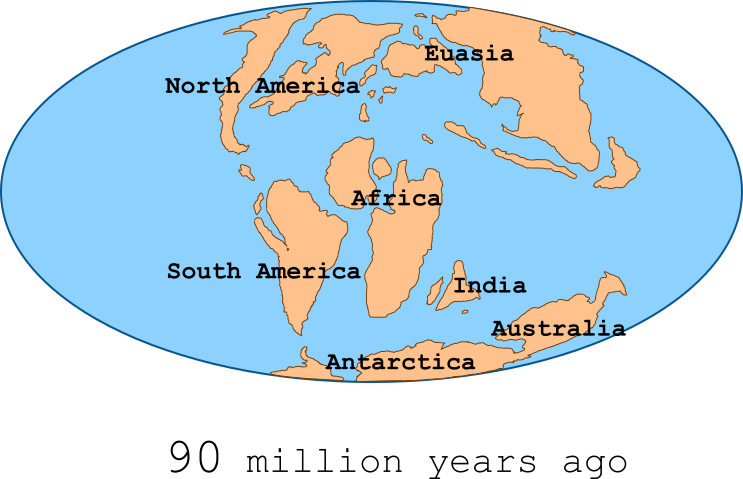 Laurasia started to become North America and Eurasia. Tyrannosaurus rex and Triceratops lived in North America. The climate was warm so the sea level was high and there were lots of inland seas. There was a mass extinction at the end caused by a big asteroid in Mexico 66 million years ago. The only dinosaurs to survive were birds, crocodiles and alligators. That was the end of the Mesozoic era. The next era was the Cenozoic and we are still in this era. The first period of this era is the Paleogene. It started hot and humid then it got cold and dry. The sea level dropped by the end. India crashed into Asia to make the Himalayas. The age of the mammals began. In the beginning there were only tiny mammals. Later lots of different mammals evolved including primates. The Neogene period started 23 million years ago. Giant sharks were the bosses of the ocean. Megalodon was the biggest and it is the most famous. Megalodons ate whales, orcas, smaller sharks and other large animals. At the end of the Neogene it was colder and the megalodon got extinct. During the period some monkeys started walking on two legs. The first primate to use stone tools was Homo habilis 2.8 million years ago in Africa. This started the Stone Age. Finally the Quaternary is the last period. It has two epochs; the Pleistocene and the Holocene. There were many ice ages in the Pleistocene. During each ice age a lot of the land was covered with ice and the sea level was very low so that there was more land and Australia was connected to Papua, and North America was connected to Siberia. 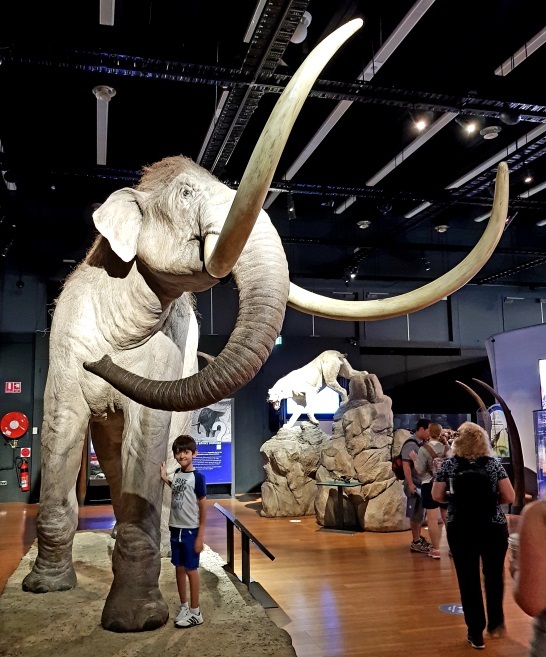 There were many large mammals like mammoths, giant bears and giant kangaroos. Homo erectus evolved 1.9 million years ago. They were the first hominid to leave Africa and spread to Asia. They used fire a million years ago. The next hominid to leave Africa was Homo heidelbergensis. They spread to Europe and Asia. 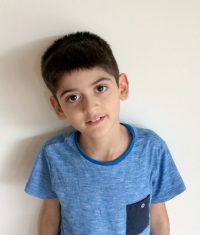 In Europe they evolved into Neanderthals, in Asia into Denisovans, and between 200 000 and 300 000 years ago in Africa they evolved into Homo sapiens. Homo sapiens left Africa about 125 000 years ago to Yemen and about the same time to North West Africa . 75 000 years ago a huge volcano erupted in Sumatra. It formed ash in the air over the whole world. The sunlight was blocked and the Earth was colder. Humans were nearly extinct. There were only about 2000 people 70 000 years ago. Humans went to Australia about 65 000 years ago. Humans came to Europe and Siberia about 45 000 years ago. They met the Neanderthals in Europe who were extinct 5000 years later. They went to North America about 16 000 years ago, and South America 15 000 years ago. The Fertile Crescent was an area in the Middle East with lots of rivers. Grass evolved into wheat about 9000 years ago. People here started to farm wheat. They did not have to be nomadic and they built villages. At about the same time grass evolved into rice and was farmed in the Pearl River Valley in ancient China. At about the same time in Mexico and Central America grass evolved into corn. This was the beginning of the Neolithic Period or New Stone Age. Near the end of the stone age some people started to use copper for tools and weapons. Copper was not that good because it was a little bit soft. The stone age ended at the start of the Bronze Age. Copper was melted and mixed with tin to make Bronze that was much harder than copper and stronger than stone. One of the earliest civilisations in the Bronze Age was upper and lower Egypt. People lived close to the Nile river. The Bronze age came to Egypt in 3150 BC. Soon after Egypt united and people started to write words with pictures. The Old Kingdom was the first great period of united Egypt. They built huge pyramids. The capital was Memphis. The Old Kingdom collapsed into two parts in 2181 BC. Upper Egypt defeated Lower Egypt in 2055 BC. This was the beginning of the Middle Kingdom. Thebes was the capital. They started writing fiction stories. Egypt broke up again in 1650 BC. People from many places came to Lower Egypt at the end of the Middle Kingdom. Upper Egypt took over Lower Egypt in 1550 BC. This was the start of the New Kingdom. Egypt became an empire. They had a lot of battles with the Hittites. The Hittites were a Bronze Age civilisation in Anatolia. Hattusa was the capital. They invaded most of modern day Turkey and Syria. There were many other Bronze Age civilisations in this area including the Mycenaeans, the Assyrians and the Babylonians. They all traded with each other. The Indus Valley civilisation was in modern day Pakistan and made same size bricks. We don't understand their writing. The Bronze age in China started at 2000 BC along the Yellow River. It was a challenge to control floods from the Yellow River. The first dynasty that we know so far was the Xia dynasty. In the 1200's BC most cites were destroyed in the East Mediterranean and people seemed to stop writing. This was the Bronze collapse and nobody knows for sure what caused it. People stopped using bronze for tools and weapons and started to use iron. This was the beginning of the Iron Age. There was a lot more iron ore than copper ore but it was harder to smelt iron ore because it needed a higher temperature. To smelt iron ore they need a temperature of about 1250 °C. In the Ancient Near East the Iron Age started at about 1200 BC. The Assyrians were the first to use iron weapons. The Assyrian kingdom lasted from 2500 BC to 609 BC. Assyria was not affected much by the Bronze Age collapse like most places in the area were. The Neo-Assyrian Empire lasted from 911 to 609 BC. They built lots cities, roads and palaces. The Babylonians and the Medes made an alliance and destroyed the Neo-Assyrian Kingdom by 609 BC. The Persian kingdom was a vassal state of the Median Empire. Cyrus the Great was a king of Persia. He took over the Median Empire by 550 BC, then Lydia and then the Babylonian Empire. And then he took over many places in Central Asia. He was respectful to people that he took over. Later the Persian Empire took over Egypt. And they tried to take over Greece but that is a huge story.